Our administrator and faculty consist of well-trained and dedicated professional educators. All five faculty members hold Bachelor’s degrees, one faculty member and the administrator hold a Master’s degree. All faculty members are required to have teaching certificates or must be actively working on their certification. Faculty members also participate in yearly retreats and professional development opportunities. Eskuelan San Francisco de Borja in partnership with Commonwealth of the Northern Mariana Islands (CNMI) Public School System (PSS) Professional Development (PD) program, providing the ESFDB faculty with many available workshops and in-service opportunities through the faculty and staff from PSS. Since her appointment in June of 2008, Sister Susie, RVM is committed to providing a wide variety of educational pursuits for our students. 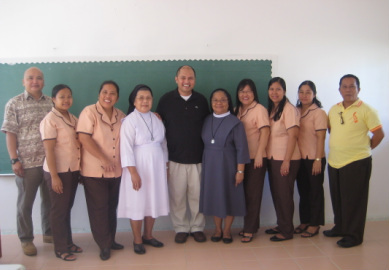 Her extensive experience in managing schools in the Philippines is an asset to ESFDB. In her tenure as the administrator, the school has seen many changes to cope with the poor economy in the CNMI. There are still many challenges, but Sr. Susie, RVM is always on top off it. Her outstanding work performance is a reflection of her commitment to Catholic education. Her goals are to guide the only Catholic school in Rota into a brighter course financially, academically, and spiritually. 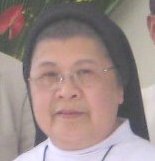 Assigned to assist Sr. Zosima Capua, RVM, at ESFDB. She is the Religion teacher for the 5th to 8th grade students. Also, she is assisting the 1st and 2nd grade with reading and story telling. In addition, Sr. Nic is assigned to the school library and giving the students the opportunity to check out book for their reading enjoyment. Because of her vast teaching experience in ministry work, her spiritual guidance is a plus for ESFDB. Her outstanding work performance is a reflection of her commitment to Catholic education. She had contributed to various schools in the Philippines and the United States. Mrs. Chavez is the adviser for grades 1st and 2nd. She has been teaching at ESFDB for many years now and has exhibited the qualities of a true professional in the field of education. As it is evident in the number of years that Mrs. Chavez has been teaching at ESFDB, she has taken lead and had been involved in numerous school leadership roles and extracurricular activities that support student learning. She had served as the school board member, coordinated First Communicants, and served as the school’s Spelling Bee coach to name a few. She volunteers her personal time assisting the San Francisco de Borja Church, helping with it’s annual patron saint festivities and other various church functions. A professional as social personality has caused her to maintain respectable relationships with the administration, teachers, staff, students, parents, and community. Mrs. Lucero has been with ESFDB for quite a long time just like Mrs. Chavez. She serves as the class adviser for the 7th and 8th grades. Mrs. Lucero is a great asset to the ESFDB family as she exhibits the qualities of a professional educator. Mrs. Lucero goes beyond the call and nature of her assignment to help the church, school, students, and parents. She works many long hours on various church and school activities and have astonishing results because of her refusal to quit working for the good of the church, school, and community. She is always willing to help others, and stand available and approachable to the church, school, community, and most especially the students. Mrs. Lucero is hardworking, committed, and dedicated educator who does more than what it takes for students to be engages in their learning. Better known as Mr. Jess, he has been with ESFDB for many years now and has contributed to the school, church, and community in so many ways. He is the adviser for the 5th and 6th grade. Mr. Jess brings self-confidence in teaching science and math. He knows the subject inside and out. He shares the love for the subject and that influences the students greatly. What is notable about Mr. Jess, is the quality and beautiful choreography he has done for the school, church, and community. She seeks no special recognition of what he does, but what counts are the successes he see from his students. He is one teacher that is willing to put his heart and soul in choreography and teaching, benefiting from his outstanding work attitude. BSCE - Bachelor of Science in Chemical Engineering w/units in Education. The students whom Mrs. Anglo has the privilege of working with this school year, are the Kindergarten class. She will serve as their adviser. Mrs. Anglo demonstrates academic growth and classroom discipline for she takes extra time and effort to ensure that the lesson for each day is well prepared. She earnestly strives to give her students an equal opportunity to shine. When a teacher shines, her students sparkle! Mrs. Anglo has a good touch and rapport with her students and communicates well with them. Building relationships with her students is an essential component in her personal instructional and learning activities. She believes that educating a child is everyone’s business. She keeps a positive attitude, have an open mind, a warm smile, and unique personality towards teaching and learning. It is very hard to describe in many words that Mrs. Salcedo has made in the lives of our Pre-School toddlers. Her friendliness, enthusiasm, and dedication makes her a dynamic Pre-School teacher. Mrs. Salcedo puts so much care into preparing her classroom and lessons to the individual needs of her little angels. She understands the important role families play in education, constantly chatting with parents about how the day went in the classroom, discussing children’s progress, or encouraging their participation in educational activities. It no secret that her role in school is critical and vital. She does her very best to serve the administration, faculty, staff, students, parents, and community. She works closely with the administrator in regards to finances, budgets, grants, student records, and school supplies to name a few. Mrs. Maratita goes the extra mile, extending her services to all to make sure quality education is rendered to the students and thus, works closely with teachers in their classroom needs. Because of Mrs. Maratita’s ability to work well with others, she has built a positive relationship with students, teachers, and most especially the parents. In addition to her office duties, she takes on the responsibility of teaching the 1st and 2nd grade social studies. She has that big heart and dedication towards all the most challenged and diverse students in school. Mr. Maratita is a part time teacher and serves as the school’s board president. Known as Mr. Ed by his colleagues, has taken over the 3rd and 4th grade class after the departure of Sr. Margie, RVM. His tenure at ESFDB, has taught a wide range of subjects. Aside from normal load of classes to instruct, he’s after school prevention programs such as DARE, GREAT, and GUTS keeps him busy. He is the director of the Pacific Regional Training Institute in collaboration with the U.S. Department of Defense various military branches based out of Hawaii. Being the president of the school is a big responsibility for Mr. Ed, as the operation of the school is in his hands and the hands of the other board members. Its success or failure rest primarily with the board. Mr. Ed never comes with problems without acceptable and possible solutions. He welcomes the challenges and changes that is forthcoming. Better know as Mr. Odie by his close friends, he is the technician and maintenance go to guy of ESFDB. Mr. Odie is a skilled worker who takes great dedication and pride in everything he does, whether it’s repairing buildings, maintaining and beautifying the school grounds, monitor the safety of the students, or preparing the campus or other sites for ESFDB events. His creativity and dedication to the school are evident by accomplishing many assignments. He is quick to respond to the administration and teachers request and always on top of his game when it comes to emergencies. Mr. Odie, who has perhaps the most difficult job of all, is able to exhibit and exemplify good work ethics and always positive about the daily obstacles and challenges that the school experience on a daily basis. On January 2011, Mr. Odie had to leave ESFDB to join his family in Saipan. Mr. Odie left with lots of fond memories and the ESFDB administration and faculty wishes him best of luck on his future endeavors. Mrs. Costales joined the ESFDB family in January of 2011. She replaced Mr. Odie as a part time maintenance/property custodian. Mrs. Costales will be an assest to ESFDB. She works hard and is dedicated to her work as evident of the cleanliness of the school campus and its surroundings.